You can help with your financial support by giving directly to CSC, or Pay Pal, or contributing through Combined Federal Campaign (CFC #34868). Join the community in supporting our work at our annual Fall Festival. It’s a day of fun, food, and cultural performances. This year’s Fall Festival is Saturday October 14th from 11 am to 3 pm at the Chinese Community Church at 500 I (Eye) Street, NW. Through our programs and combined efforts, we strive to make a difference in the lives of newly-arrived immigrants and in so doing assure them they are not alone in their struggle to make the necessary adjustments to living in America. 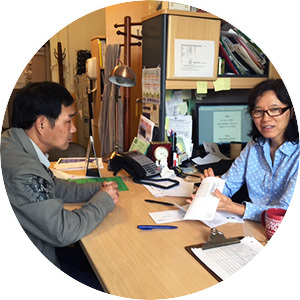 Volunteer with us by providing instructions as a tutor, help with day-to-day office work, attending to needs of immigrants as they arise such as accompanying clients to doctor’s office. Many of our current tutors are long-serving some with over 20 years of service. This longevity of service reflects the deep satisfaction of serving and wanting to contribute and make a difference in the lives of immigrants. Some identify with immigrants because their parents were also immigrants, while others witness the hardship immigrants endure and desire to help immigrants make a smoother transition. Others who have tutored initially merely wanted to maintain or improve their Mandarin but ended up staying because they loved the interaction with the students and derived tremendous satisfaction from providing assistance to those in need.